Quality Control Consultants Group, LLC began in 2006. Its purpose was to enhance quality control for all manufacturing parts suppliers. Later that same year, there was a need to form the assurance group to work hand in hand with the consultants group as an important alternative to a larger 3rd party company. QCCG continues to provide high quality services that are customized for each location. We were founded on the concept of taking a smaller company and working with the larger parts suppliers and OEMs on a personal level to form relationships that larger corporations often overlook. We use that same working model to work with our clients so that we become part of their company: working together with a common goal. QCCG associates can work to resolve issues in most supplier/manufacturer relationships. We will work hard to find and incorporate the most effective solutions to meet your business needs. 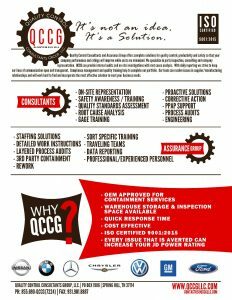 QCCG, LLC is committed to being the leader in providing quality control services and quality inspections by requiring a higher standard, customized training per job requirements and working to exceed customer expectations while determining any applicable requirements. Our company values integrity and honesty in our customer and employee relationships. Through the continuous improvement of our QMS, we will deliver services and solutions for quality control and productivity so that company performance improves and customer satisfaction is achieved.